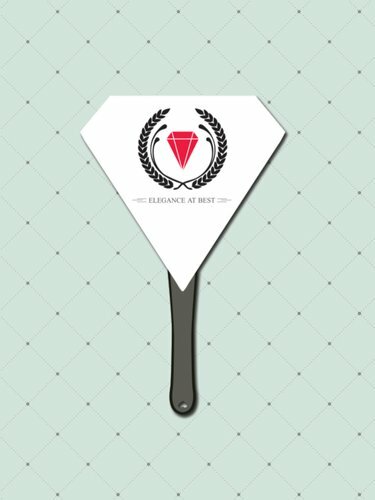 Gem Diamond Hand Fans Design Gem Diamond Hand FansCustom Lanyards with high shine finish that makes them stand out from crowd, a great product for promotional events. Your degin or logo will stand out good due to its shiny finish. These purpose-made Gem Diamond Hand Fans will create refreshing breeze for your guests and customers who will love cooling themselves with these fans! They have stunning shapes to attract everyone’s attentions at outdoor events being great party favors. When there is high temperature, people will be looking for these fans to stay cool and show their support for the occasion. They are printed with the finest digital offset printing techniques on the thick 16 point card stock board which makes them sturdier. These fans will work as great giveaways and will make your message readily visible for everyone who uses them. This will serve your business branding and promotion purpose as well!